Though he does not identify himself as libertarian himself. I do not have your intellectual certitude on this issue. Do you really think that I'm not telling the truth when I say that? Perhaps a study of the complete works of Frank Beckwith would convince me otherwise. I am even less sure that I would know how to produce a good legal argument against Roe v. Wade, because in a legal context you have ways of blocking the sorts of "err on the side of life" arguments that I would use if I were trying to talk someone I knew not to get an abortion. And I have even more serious doubts about the standard conservative attack on Roe: that it involved judicial activism. It seems to me that the right of privacy is constitutionally grounded. But to defeat Roe, it seems to me that you've either got to make that argument, or make the argument that we can achieve a rational consensus that fetuses are persons from the moment of conception. Both seem to me to be difficult cases to make. (I wish I had Hasker's debate with Sullivan available to me now). All you have with any political leader is their professions of Christian conscience. The pro-life position is appealing in the sense that you don't get stuck with the problem of accounting for how fetal life comes to acquire the full rights of personhood. But to go from there to the conclusion that there is no moral difference between taking the life of a zygote and taking the life of a two-year-old looks like a stretch to me. I think some of the considerations that support the right to life are some of the same ones that push me in the direction of the Democratic Party, the concern for the defense of the weak and disadvantaged against the powerful. (Probably the strongest moral theme in all of Scripture). So I would very much like to move my party away from the sort of rhetorical position that really sounds like life in the womb doesn't matter. Perhaps after what I anticipate will be Obama's election victory, my post will be entitled "An Open Letter to Barack Obama" urging him to take fetal life seriously and to move away from the sort of Planned Parenthood party line we are so used to hearing from Democrats. I really think that neither political party has enough power, with our two-party system, to push through a change in the Supreme Court sufficient to overthrow Roe and get us to the place where abortion is illegal in many states. So long as there is a partisan deadlock on this issue, no progress will be made. I find this whole issue extremely difficult, and I have never tried so hard to me intellectually honest in all my life. James Howell, on Ben Witherington's blog, suggests otherwise. I really and truly believe that the partisan, no-compromise positions taken on each side of the aisle on this issue result in more dead fetuses than necessary. I'm afraid that if I were strongly pro-choice, and I were to hear some of the Holocaust rhetoric that I have been hearing in the combox here, I would retreat to a firmer pro-choice stance than I would if pro-lifers were to say, "There are a bunch of you pro-choicers out there who really think abortions are bad things; let's see what we can do to reduce them." But in an election year, it's easier for the Republican to yell "baby-killer" and the Democrats to yell "they're taking away your right to choose." But, you say, Obama is a pro-choice extremist and won't listen? Try him (if he is elected). Appeal to the Christian conscience he says he has. If people try it and it doesn't do any good, and there isn't a reduction in abortions, you can come back to me and say "See, I told you so." Since the issue of Christian doubts has come up on a couple of blogs, I thought this, from Plantinga, would be of interest. with what one hopes are the consolidation of small but genuine gains. convinced of its main lineaments as that I live in South Bend. I got this from someone at Spare Oom. SARAH PALIN: BECAUSE, I WAS GONNA SHOOT HIM FOR BLOCKING MY VIEW OF RUSSIA ! Transcripts, audios, and videos. It's all here. I am told that the correct name for trickle-down economics is supply-side economics, and that trickle-down is an insult. Very well, call it what you want. The question is, does it work? It almost sounds to me as if you are saying "Even if we lose all the other arguments, and Obama is the better choice on every other ground except abortion, you as a Christian are obligated to vote against Obama for that reason alone." But even the actual Obama quotes don't seem to me to say that he wants these "abortuses" to die. He may have been misinformed about whether born-alive fetuses would be left to die. He also has made statements to the effect that "health of the mother" exceptions on late-term abortions should be made clear so that they don't cover just anything. What are you suggesting, that Obama just likes seeing women get abortions? And isn't it illegal to let babies die, anyway? My arguments have been this. 1) Roe v. Wade will almost certainly not be overturned regardless of who is elected President. 2) Even if it is overturned, it will not result in many babies being saved through legal restrictions. I would be surprised if any state, even the reddest of the red states, would pass a comprehensive ban on abortion. 3) Abortion rates rose until the Clinton administration, after which they have steadily decreased. There may be many reasons for that, but one of the has to be the passage of the Familay and Medical Leave Act, which made it illegal for employers to fire employees who took unpaid time off to bear children. Health care reform would be another way in which abortion might be discouraged. 4) I don't see an overwhelming case for the simon-pure pro-life position. I can see both sides of the issue, and some of my moral intuitions suggest that you can't give the same right to life to something that is not conscious that you do to something that is. I'm not coming out as a staunch defender of "a woman's right to choose" and would like to see more restrictive laws on abortion than are presently allowed under Roe. 4) While abortion is an issue that generates a lot of moral passion, other issues, such as slavery, poverty, corporate responsibility, misguided wars, torture, and global warming (or climate change if you prefer that expression) are also moral issues of considerable importance, and they are issues where the President's action have a much greater and more direct effect than in the area of abortion. So no, I reject the case for a one-issue abortion-based vote. I have made these points a number of times here. If you think this makes me "every baby-butcher's best friend," you should reflect on how many babies have been saved from abortion as a result of 8 years of Reagan, 4 years of Bush I, and 8 years of Bush II. This is a matter that was settled by the one branch of government deliberately set furthest away from the political arena, the judiciary. I'm also convinced that we have not exercised enough leadership in looking for ways to decrease abortion apart from the long arm of the criminal law. If you want to grapple with something that bothers me about political conservatism in the economic sphere, it is what seems to me to be a commitment to the trickle-down thesis. The idea is that lowering the tax burden on the higher economic levels will stimulate the economy in general, create jobs, and benefit the people down the scale. I think this is the heart of what the Republicans are using Joe the Plumber to illustrate. Joe himself probably won't be harmed by the Obama tax plan, quite the reverse. However, if he were to get into a position where his profits exceeded $250,000, then the tax plan would increase his taxes (though, I'm told, by just 3%). However, this might cripple his ability to employ Jack the Plumber, Bill the Plumber, and Suzanne the Plumber (let's not be sexist now). But does it work that way? In particular, does anything trickle down in America when a large corporation goes multinational, and finds labor in Mexico, China, and elsewhere, countries unfettered by American labor laws? I tried to research the argument that Thomas Sowell had made that it is a mistake to hold that conservatives subscribe to trickle-down economics; that the term itself is a straw man. Offhand, I don't see why it's a straw man. Ross Perot said "Trickle-down didn't trickle." Where is that guy now that we need him? I think if everyone successfully avoided the ad hominem fallacy, then we could truly learn something when Uncle Joe, the born-again Christian, and Uncle Charlie, the village atheist, got together around Thanksgiving dinner. Or when Uncle Bill, the Rush Limbaugh admirer, and Uncle Bob, the who has seen every Michael Moore movie 10 times, get together. Ad hominem is the shift of attention from issues to people. It is difficult to assess the merits of Clinton's economic policies, it is far easier to talk about cigars, interns, and finger-wagging. It's also easy to portray Bush as stupid and Clinton as slick, than it is to actually address the issues involved in their administrations. There is a necessary aspect of political discouse that does involve evaluating not merely the positions of the candidates but their fitness to serve. I have problems with the Palin selection from that standpoint, but I don't think that's a subject that can be fruitfully pursed at this point. We can talk about Obama's association with Ayers and Wright, McCain's association with Keating, and Palin's association with the Alaskan Independence Party unit we are blue in the face. Nothing will be achieved. I try to keep everything personal off this blog. I made an exception mentioning my aging and now deceased parents in the context of a discussion of Social Security and Medicare, and regret it now, for obvious reasons. By the same token, I really don't care how old Steve Hays is, or who he lives with, or whatever else. The debate should be about issues not people. As for diagnosing intellectual dishonesty, as Obama said in another context, that's above my pay grade. It's enough to show someone is mistaken, if you can. Showing that they are somehow dishonest requires abilities beyond the capacities of mere mortals. At least that's how I see it. How do we improve the tone? We avoid ad hominem arguments. I have linked to a Wikipedia treatment of the ad hominem fallacy. Political posts, like other posts, are partly there to defend what I believe in, but they are also designed to generate critical thinking. I know this is a forum in which liberals and conservatives can enter the discussion. I also want people to realize that Christians can exercise some independence of mind when it comes to politics. I have seen this from both liberals and conservatives in the comment box. When I talked about improving the tone of the discussion, it is important to realize that I mean for it to begin with me. I can't control Steve Hays or Ilion or anyone like him. I don't know what to say to people who think that anyone to the left of John McCain is an intellectually dishonest evildoer. I also don't know how to respond to people who think all Christians (or atheists, for that matter) are stupid, ignorant, insane, or wicked. That kind of certitude has always escaped me. If my posts serve only the goal of political advocacy, they fail by my own standards. It's easy to hit easy targets. Is Joe the plumber a leaky story? I don't know if any of you have been going over to Triablogue, but I have been treated over there to the harshest personal attacks I have ever received from anyone from Steve Hays. Compared to him, Steven Carr has been the model of politeness. To Hays, it isn't enough to say that I am backing the wrong candidate for President. I have been compared to Goebbels, called a Red Philosopher, a Baby Butcher's Best Friend, a poseur, a goose-stepping apparatchik for the left, a false philosopher and a false Christian, and even someone too stingy and selfish to help his own parents in their old age, since I said I was sure glad they got Social Security and Medicare when they advanced in age. He presumed that, all this time, I was a tenured professor, which, alas, I have never been. To him, this isn't a debate, this is a police interrogation. Anything you say can, and will be used against you. I am quite sure I don't deserve this treatment. At the same time, I have to ask myself if I have done the best job I could, not merely for making the case that a Christian can support Obama, but really exploring the issues in a helpful way, encouraging critical thought, and not simply shooting at easy targets. This is a blog, not a set of publishable essays. I'm trying to open honest discussion, not speak the last word on matters of considerable dispute amongst Americans. In the philosophy of religion, I would like to think that my efforts have created a more civilized playing field, where people on both sides can discuss their differences. I may not have done so well on political matters. I can't think of anybody in political history who has rubbed me the wrong way as much as Sarah Palin has. It may be my intellectualist bias; I expect my political leaders to have thought-through positions on issues. Maybe that's asking too much, I don't know. I know some would say that even if she doesn't have thought-through positions, at least she doesn't take the wrong positions. But from the first time she opened her mouth and tried to grasp the mantle of Hillary Clinton and the 18 million cracks in the glass ceiling, despite complete opposition to everything Hillary stands for, I have found this choice to be an insult to the intelligence of the American people. Because I think Obama has health care right, the economy right, Iraq and Afghanistan right, and for a number of other reasons, I do support him for President. I'm not a simon-pure pro-lifer, but I would like to see more commitment to the value of unborn life than he has shown so far. Despite evidence that of pro-abortion extremism, I'd like to think that he is persuadable on, say, a partial birth abortion ban. (There's the audacity of hope for you!). I'd like to see a grass-roots, bipartisan effort including both pro-lifers and moderate pro-choicers (the combination of these groups surely constitutes a majority in America), to get together to look for ways to minimize abortion. Maybe a Coalition to Minimize Abortion should be formed. Do a little community organizing. Because I think that with the current political deadlock, with "the right to life" and "a woman's right to choose" used as a means to get out the respective party bases, there is little chance of doing anything on the abortion issue that makes any progress from anyone's perspective. Of course, if you think I have all the other issues wrong, this won't impress you. Fine. I do respect thoughtful conservatives like Bill Vallicella, in spite of my deep suspicion that the what has come out of the dominance of conservatives over the past 28 years or so has resulted in a lot of what I call corporate prostitution and the abuse of power. (These are subjects for more detailed discussion, of course). I don't think either party has a monopoly on good or on evil. This is not a rhetorical question. I do want an answer. "Our opponent ... is someone who sees America, it seems, as being so imperfect, imperfect enough, that he's palling around with terrorists who would target their own country." She also said, "This is not a man who sees America as you see America and as I see America." Does she mean that whether one pals around with terrorists or not is a function of how imperfect one sees the country? So that if she were to see the country as less perfect than she now sees it, she would then be justified in palling around with terrorists. Also notice the use of the present tense in this sentence. It's just false that Obama now pals around with Ayers, and it is also now false to say that he intends to target his own country. The most that can be said here is that he once targeted his own country and doesn't now regret doing so. Let's assume that Obama is open to criticism because of his association with Ayers. Does anything follow from that about his view of America? Is it always morally wrong to befriend former terrorists, even unrepentant ones? Would Jesus befriend terrorists, or just tax collectors and sinners? (You guys are going to stone me for asking this question). If a person is considered dead a brain death, shouldn't life (or more precisely, personhood) be thought to begin at brain birth, rather than conception or birth? The author of this essay suggests that it comes rather later than many people would have thought, but that the suggestion that personhood begins here faces some difficulties. ACORN, the new Republican talking point? I will have to admit that I don't understand this story. If I were trying to steal votes for the Democrats, this is not the way I would go about doing it. Of course we could go with a Democratic conspiracy theory; it's really the Republicans trying to discredit community organizing. But conspiracy theories are a last resort. So what gives here? I love Palin. I really do. This Palin dialogue is, I think, a prescient metaphor for the condition of the McCain campaign. Is it dead, or just pining for the fjords? I can't be sure. 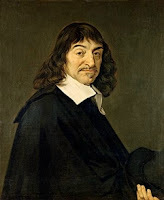 Since we will soon be starting Descartes today in Philosophy 101, I thought I would put some notes I wrote up about him on the blog. Comments and dialogue welcome of course. C. Political upheaval: Descartes time saw the rise of the modern state, and the colonization of the Americas. It also saw 30 years of war over religion, resulting in the slaughter of 1/3 of the population of Europe. C. If we are machines, then whether we do right or do wrong is a function of how we were programmed. Given the basic laws of the universe and the initial positions of the atoms, we could not have done otherwise from what we did. D. If we could not have done otherwise from what we did, then the idea of sin makes no sense. We are not, in any significant sense, responsible for our actions. What’s worse, if you assume there’s a God, the God is responsible for all of our worst sins. This does not seem compatible with the idea of a perfectly good God. V. The Jesuit solution: The Protestants, for example, maintained that it was possible to doubt the truth of the Church’s teaching by appealing to the Bible. At the Jesuit school that Descartes attended, they taught him that this would result in an unending chain of doubts. You can doubt the Church on the basis of the Bible. You can doubt the Bible on the basis of science. You can doubt science on the ground that it appeals to sense experience, which can be doubted. Once the spiral of doubt starts, it can’t be stopped. So just believe what Mother Church tells you to, and don’t ask so many questions. A. Descartes is not satisfied with the Jesuit Solution. However, he does learn something from the Jesuit method. But he develops the method of universal doubt not to undermine confidence and force reliance on the authority of the Church, but to discover what he can really be sure of. VI. Two models of knowledge: The house model and the boat model. According to the house model, what makes a belief system stad up is its foundation. If a house is shaking, tear it down, put in a secure foundation, and build it up again. On the boat model (attributed to Neurath), we have to replace planks as necessary, but tearing the whole boat apart would be a mistake that would cause the boat to sink. VII. Method of doubt: Doubt everything that can possibly be doubted, not simply what can reasonably be doubted. A. Sense experience and the Dream Conjecture. Could I really be dreaming? Well what if I pinch myself. But then I could be dreaming the pinch. So I pinch myself again, and again, and again, until I really do go unconscious and start dreaming! B. Mathematical Truths: Descartes introduces the Evil Demon conjecture. Is it possible that SATAN IS CONTROLLING YOUR MIND? (Perhaps you have been listening to too much rock music, with Satanic lyrics put in backwards, and now SATAN IS CONTROLLING YOUR MIND). Well, what Descartes means is an omnipotent being (unlike the fallen angel Lucifer) who is dedicated to deceiving everyone as much as possible. In order to discover what we can really be sure of , Descartes introduces the Satan Test. Something can be included in the foundations of knowledge only if, even on the assumption that Satan is controlling your mind, and wants to deceive you as much as possible, you can be sure that this belief is true. D. How about the belief that I am now thinking. Could Satan deceive me into thinking that I am now thinking? Well, if he DECEIVED me into thinking that I am now thinking, then I would have to not be thinking. On the other hand, if I had the deceptive thought that I am now thinking, I would have to be thinking. The idea that I am now thinking is indubitable, because a contradiction emerges when I attempt to consider that possibility of being deceived about it. E. What about the belief that I exist. Well, if I can be sure that I am thinking, then it follows that I exist. Or, as you no doubt heard before you ever took Philosophy, “I think therefore I am.” Although you may have heard it a million times (in fact it’s a great thing to say after a few beers if you want to impress someone with how deep a thinker you are-NOT), this is what it means in its original context. “I think” and “I exist” pass the Satan test, because even on the assumption that Satan is controlling my mind, he can’t possibly deceive me about these two claims. Richard Dawkins goes to the movies. We all agree that the actual Robin is a coward, and that the song is false. But what about the Robin of the song. According to the popular definition of courage, one is courageous if one either lacks fear or ignores danger, and certainly the Robin of the song satisfies that requirement. However, Aristotle's definition of courage suggests that a courageous person lacks (or fails to act upon) fear, or ignores danger, to the extent that it is rational to do so. This courage in facing danger can be defective, in which case the person is cowardly, on the mean, in which case the person is courageous, or excessively, in which case the person is foolhardy, and hence does not possess the virtue of courage. Notice also that it is possible for someone to "bravely run away," if we accept Aristotle's account of courage, however paradoxical that may seem. The reason Sir Robin is a coward is because the three-headed monster is bickering with itself, and hence cannot possibly be as dangerous as it might appear to be at first. Robin doesn't think long enough to figure that out, instead he "turned his tail and fled."